Erin from Milton, Ontario, recently wrote to tell us about her Coyote encounter, she says ..... I heard some howling one night a couple weeks ago and I'm familiar with hearing Coyotes howling off in the distance because I grew up near Britannia and Guelph Line where you can hear them all the time. I was curious as to why they sounded so close by, so I got up and looked out my window. To my surprise there was at least 5 - 7 Coyotes standing in the middle of my lane-way. Something spooked them so they ran away, but I was still shocked that there was that many so close to my house. I live in the Bronte St South area , behind the hospital. Garrett Gosse of Brantford wrote to say ..... On Saturday November 22nd or rather early morning of the 23rd, I was awoken by the sound of, a pack of what I believed was, a pack of coyotes and the low bark of a dog. The yipping was a little unsettling as I felt something was being attacked. All of a sudden the dog stopped barking and it was silent and no Coyotes could even be heard. The next evening around 9 pm I heard a dog barking again and the yipping sound of the Coyotes. I decided at that time to go online and google the sound of Coyotes attacking. Sure enough it was exactly the sound of what I just heard and was awoken by earlier that day. All this took place in West Brantford in the Shellard Lane area which not too long ago was farmland and a nice country stroll to the high school, Assumption College. My home, which is now located on that old farmland, backs onto the trans Canada trail which has a farm on the south side of it. A week earlier I saw a deer running by on the same farm. One week I see a animal I love to watch and the next I hear a group that scares me. This area would be great for Coyotes since there are many rabbits and other wildlife that Coyotes like to consume. All I know is that I would not want to be confronted by a group of hungry Coyotes. A reader says ..... Monday October 20th - 7:00 a.m. While walking my Springer Spaniel to the soccer field at the school, I kicked a ball which landed 10 ft beside the garbage dumpster. My dog arrived at the ball first (30 seconds); and as soon as I arrived to the dumpster (opening now at head level beside me). A Coyote lunged out of the dumpster - landing straight on top of my dog! The Coyote obviously thought my dog was alone, but as soon as he was flying over my shoulder I screamed, very loudly. I'm not sure if it was my scream, or whether it was because my dog was growling on the ball - but my dog chased the Coyote into the forest. Thankfully. Be careful out there; Protect your Pets; Arm yourselves. We were lucky - this time. A reader wrote to tell us what he spotted ..... I spotted a Coyote on my way to work first thing on a mid October morning before the sun was up. It was on the front lawn of a house which is located at the edge of the subdivision that abuts an industrial park. I reversed the car to put the head lights on it. It scampered away down the street into the neighborhood. I live in the west end of Guelph, Ontario. I have been told that there have been sightings in the parking lots at the factories in the near by area. Sharon Burton from Brampton, Ontario, wrote to tell us about the Coyote she saw at mid-day ..... November 28, 2014 - I live on Royce Ave. The first part of this week our neighbor saw what he thought was a big dog. It was walking up the middle of Royce Avenue. When he realized that there was no one walking with it he went to his front door and called out to it. It turned around and started to walk down where he came from. It was then that he realized it was a Coyote. He was able to take a picture. The Coyote went back to the ravine area. I am a bit nervous that they are coming out in broad daylight. When I walk my dog now I take a pole and a clapper with me. 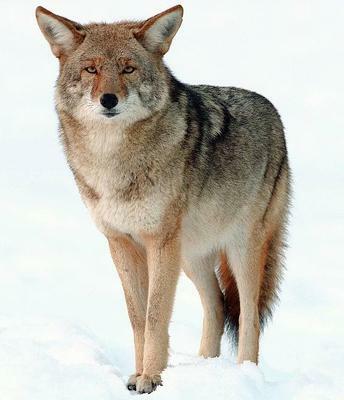 Jose from Toronto wrote to tell us about his sighting of Coyotes in Scarborough, he says ..... I was driving northbound on Warden Avenue just north of Eglinton at about 9 pm on a crisp fall evening, when I was forced to stop my car to avoid hitting two Coyotes. They crossed the street as if they owned the road. My girlfriend commented on how rough looking the two dogs were and I advised that we were observing Coyotes and not dogs as I had encountered them before, but never this far south. Its just a sign of the times as we encroach on every square inch of land and leave wildlife with fewer places to call their own. Thank you all, dear readers, for sending us your Coyote sighting reports. We receive many reports each week, and the most efficient way to publish them, is to combine them into one report, such as this. Thanks to you, and other readers, people can use this website as a resource to find out more about Coyotes which may be living in their neighbourhood.